I got the new Blackbird Designs and JCS ornament issue. I also got a couple LHN ornaments and an oldie from Carriage House. "As Life Wears Away." I have always loved this design! I think going to Amy's is going to help get me out of my slump. I feel energized to stitch again!! 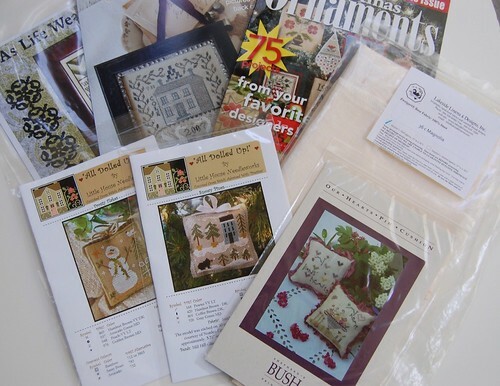 :) Well, I'm going to get back to organizing my new stash and maybe settle down to finally get some stitching done! 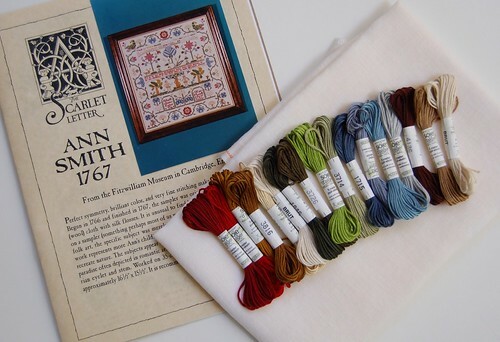 Love, love, love the Ann Smith sampler! I can't wait to see your start! Wow that looks like a lovely sampler you are starting...I have never ordered a SL sampler pattern...I've been avoiding looking LOL! Isn't there something so satisfying & exciting about seeing everything kitted up ready to begin? I have been trying not to buy stash lately and concentrate on the framing pile instead but it's hard. The great thing about blogging is we get to see ideas from others and I don't think anyone minds if you take an idea from them, otherwise why would be they be blogging. :) Have a great week. Lovely new stash. I can't wait to see you stitch it up as I love your stitching. I hope this gets your mojo back. Love stashing! Looking forward to seeing your start on Ann Smith - she is so pretty! I looove Ann Smith! Those colors are delicious. I really like to browse through SL charts. I hope your mojo comes back soon! Great stash! Yes, I had to kit up Ann Smith as well because of Glenna. I have yet to decide what fabric I'm using though. I just love that piece! Stash! No better word in the English language! Glad you got your stitching groove back...Amy is good for that! Great new stuff....now we want to see thread to fabric! Nothing like great stash to get one motivated! Looking forward to seeing how it stitches up! Nice stash! No need to apologize, I just love magnolia and want to share it with all my stitchy friends! I like those cutie-pie Christmas ornies, and can't wait to see my copy of the magazine! Nice stash! It's always exciting to add to stash treasure! I haven't seen the SB pincushions - they are pretty and I think will be added to my stash, too. You're right - the linen is perfect for that design. I hope it helps you with your slump,too, as your work is always a joy to see! I just love your work and your pictures. How do you do to get that light? New stash is always fun! Enjoy getting back to some stitching. Lots of Fabric For Sale!